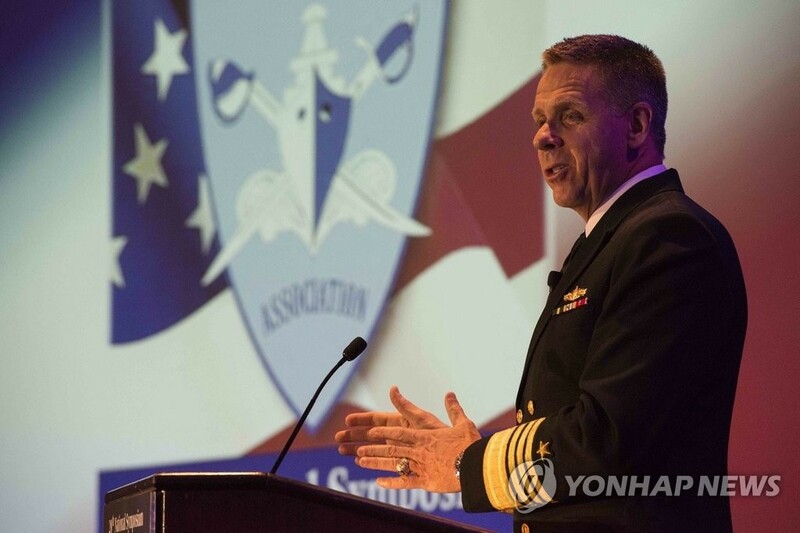 A top U.S. military commander on Tuesday expressed optimism ahead of this month’s second summit between U.S. President Donald Trump and North Korean leader Kim Jong-un, but he also questioned the regime’s seriousness about abandoning its nuclear weapons. The remarks by Adm. Philip Davidson, chief of the U.S. Indo-Pacific Command, come two weeks before the Feb. 27-28 summit in Hanoi, Vietnam, where the two leaders are expected to flesh out measures to achieve the North’s denuclearization in return for U.S. security guarantees. “We think it is unlikely that North Korea will give up all of its nuclear weapons or production capabilities, but seeks to negotiate partial denuclearization in exchange for U.S. and international concessions,” Davidson said in a written statement to the Senate Armed Services Committee ahead of a hearing. As the commander noted, the assessment is in line with that of the U.S. intelligence community. Last month, U.S. Director of National Intelligence Dan Coats told Congress that he believes it is unlikely the North will completely abandon its nuclear weapons program because Pyongyang’s leaders view it as critical to regime survival. “And I am optimistic about another U.S.-North Korea summit,” he added, noting some steps North Korea has taken so far, including what he called the “reversible” dismantlement of tunnels at its nuclear testing site in Punggye-ri. “Yet much needs to be done to make meaningful progress,” he said. The Singapore summit was the first meeting between sitting leaders of the two nations and yielded a commitment from Kim to work toward complete denuclearization of the Korean Peninsula. The two men also agreed to establish new relations between their countries and build a lasting peace on the peninsula. But the exact meaning of those terms has yet to be clearly defined, with the U.S. demanding more concrete steps toward denuclearization and the North seeking sanctions relief and a formal end to the 1950-53 Korean War. In Slovakia earlier in the day, U.S. Secretary of State Mike Pompeo said he hopes the two sides will make “substantial progress” in the coming weeks. “The pillars that were agreed to back in Singapore in June, I hope we make progress along each one: security and peace on the peninsula, the denuclearization in the peninsula, as well as ensuring that we create the conditions for a brighter future for the North Korean people,” he said. The Trump administration has promised to provide economic rewards to the North if its follows through on its denuclearization pledge. “North Korea, under the leadership of Kim Jong Un, will become a great Economic Powerhouse,” Trump tweeted Friday. “North Korea will become a different kind of Rocket – an Economic one!” he added, modifying the nickname “Little Rocket Man” he used to mock the North Korean leader after his 2017 tests of intercontinental ballistic missiles capable of reaching the U.S. mainland. Gen. Robert Abrams, commander of the 28,500-strong U.S. Forces Korea, said in a separate statement submitted to the Senate panel that North Korea’s military capabilities remain largely unchanged. conventional and asymmetric capabilities that continue to hold the United States, South Korea, and our regional allies at risk,” he said. Meanwhile, South Korea and the U.S. will continue to conduct military exercises at a level that is not harmful to diplomacy with the North, he added. After last year’s summit, Trump announced the suspension of what he termed “provocative” military exercises.